Signed statements from Austin Corbin, President, and Charles M. Jacobs, Chief Engineer of the Metropolitan Underground Railway Company, 1891. City Register collection, NYC Municipal Archives. In 1891 the Metropolitan Underground Railway Company presented a grand plan for New York City. They proposed to construct a set of tunnels and tracks that would crisscross Manhattan, connecting the Battery to 155th Street, as well as Jersey City and Brooklyn at an estimated cost of $60,000,000. While elevated lines were already in existence, this new transit system would alleviate traffic, reduce noise, protect service from the elements, and propel New York into the 20th Century. Included in the proposal were plans for an East River Tunnel, drawn up by Chief Engineer Charles M. Jacobs. From Battery Park to Atlantic Avenue in Brooklyn, it would whisk travelers and freight between the boroughs in record time. Alas, the venture never came to fruition, at least, for Charles Jacobs. Instead he would helm the construction of a different kind of East River tunnel: a gas line connecting 71st Street to Ravenswood (now part of Long Island City) that was completed in 1894. Using his experience from these projects he would go on to oversee the design the North River Tunnels, which connect Weehawken to Penn Station. Map of the Manhattan-side of proposed East River Tunnel, Metropolitan Underground Railway Company, 1891. City Register collection, NYC Municipal Archives. The first public transit tunnel under the East River didn’t have to wait long. It was completed in 1907, and its terminals were almost identical to those proposed by the Metropolitan Underground Railway Company. Yet the very existence of Jacob’s plans for both the East River transit tunnel and gas line open up whole new avenues of research that previously may not have been apparent. In doing so, they connect the city like never before, providing visual clues about our history—literally from the ground up. Part of New York City and Long Island City Showing Location of Tunnel and Shafts and Property of East River Gas Company, 1894. Ports and Trade collection, NYC Municipal Archives. Shelving for maps and oversize volumes, Bush Terminal Facility, Brooklyn. 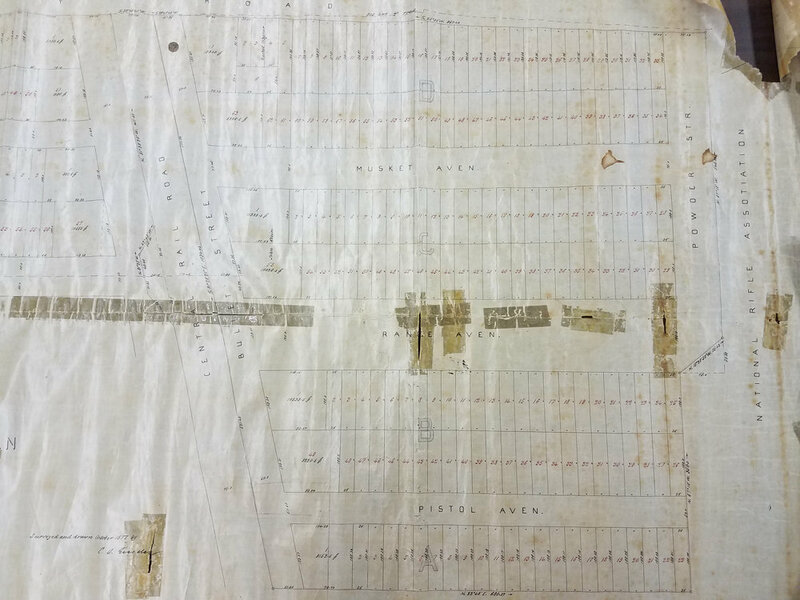 Under a grant from the Local Government Records Management Improvement Fund, the Municipal Archives has recently undertaken a survey of its cartographic material. One area of focus is the Department’s Brooklyn warehouse at Bush Terminal, where thousands of maps, blueprints, plans, and drawings related to city infrastructure are kept alongside the records of their creator agencies. Due to the continuous influx of material, as well as the difficulty in storing such fragile and oversized items, these maps can often become separated from their original collections and relegated to dusty shelves or cardboard tubes. This hinders their ability to be processed and made available for research. The survey is designed to shine a light on these collections and hopefully provide an entryway for future use. Map of Property Belonging to Hermann C. Poppenhusen, Situated at Creedmoor, County of Queens, State of NY, 1877. City Register collection, NYC Municipal Archives. Land sold to the newly-created National Rifle Association for a rifle range. Today it is near the site of the Creedmoor Psychiatric Center. Looking at the various map collections as a whole allows us to watch New York change and grow into the city it is today. Thus far, the Bush Terminal portion of the survey has identified over 30,000 items, highlighting five major collections and numerous smaller record groups. For example, the plans for that East River Tunnel are part of a collection belonging to the City Register. The Brooklyn portion alone is comprised of almost 5,000 maps stretching from the early 19th century to the late 1960s. It covers everything from early farm tracts to the numerous independent railroad routes that webbed the borough. Alongside these we find maps of Brooklyn’s wards, streets, and schools. The Queens portion of this collection is equally incredible, providing a layout of the initial grounds of the National Rifle Association (with street names like Pistol Ave.), little-remembered burial plots, and forgotten canals and creeks long-since covered over to make room for new streets and apartments. Map of Branch of the Central R.R. of L.I. Leading from Garden City to the Village of Hempstead, 1872. City Register collection, NYC Municipal Archives. The graveyard noted in the bottom-right is now in the vicinity of Denton Green Park, Hempstead. Map or Plan Showing the Closing and Discontinuing of Whale Creek Canal From Humboldt Street to the Easterly Side of Kingsland Avenue, 1907. City Register collection, NYC Municipal Archives. The East River Gas Company plans, on the other hand, belong to the Department of Docks and Ferries, an agency that has changed titles numerous times throughout the years, but which has always held sway over the New York City waterfront. Needless to say, this is an enormous responsibility. Not only does the collection contain plans for piers, terminals, bridges, bulkheads, and ferry lines, at various times over the course of its operation, this department has worked alongside the War Department, military, and navy, and had a hand in airports, island infrastructure, and trade, making it a powerhouse among the other city agencies. Untitled Map of Blackwell’s Island and Queen’s Waterfront, 1918. Department of Ports and Trade collection, NYC Municipal Archives. Proposed Municipal Market Site, Gowanus Bay, circa 1915. Department of Ports and Trade collection, NYC Municipal Archives. Supplemental Map, Profile and Survey of the Proposed Route of the Southerly Section of the Brooklyn Elevated and Atlantic Beach Railway Company, 1879. City Register collection, NYC Municipal Archives. As we delve further into these collections, the borders and names of the city shift. What was West Farms becomes the Bronx. New Utrecht, New Lots, and Flatbush get folded into Brooklyn. The borders of Queens County shrink. As the farm maps move into the early 1900s, real estate developers enter the picture. Parcel and lot maps advertise property for the growing middle class. With names designed to be aspirational and alluring (while also paying homage to the original landowners), brand new neighborhoods are born almost overnight. The housing growth goes hand-in-hand with the explosion of rail transportation, allowing for an exhaustive list of steam, cable, and horse-drawn rail lines that, in some cases, ended up as part of our current transit system. Through successive maps the street grid changes from plank roads to paved road, each one laid-out, graded, and surfaced by an army of city surveyors. On top (and below) all of this runs the city’s infrastructure: sewerage and drainage lines; parks, and bridges; government buildings, schools, police stations--everything you need for a successful metropolis. Map of a Survey Made Under the Provisions of the Charter of the Williamsburgh Water Works Company, 1852. City Register collection, NYC Municipal Archives. Map and Profile Showing Source of and Manner of Obtaining an Additional Supply of Water for the City of New York, 1905. Board of Estimate and Apportionment collection, NYC Municipal Archives. Many of these latter types of maps fell under the auspices of the Board of Estimate and Apportionment, the largest collection surveyed so far, clocking in at over 10,000 items. All city agencies had to pass their proposals through the Board for funding approval. All decisions about street and land development, water rights, transportation franchises, and commerce on city-owned land—everything occurring both under and above ground had to be checked and approved by the engineers and Commissioners of the Board. The Board of Estimate was eventually dissolved by the Supreme Court, but its functions still remain in one form or another. Map No. 1107, Showing a Change in the Street System [Rego Park, Queens], 1925. Board of Estimate and Apportionment collection, NYC Municipal Archives. Damage Map in the Matter of Acquiring Title to Additional Lands for New Police Academy, 1957. Board of Estimate and Apportionment collection, NYC Municipal Archives. It’s easy to relegate maps to the realm of imagination, marking buried treasure or secret passageways. However, a deep dig into the seemingly ordinary plan for a subsurface easement or the route of an abandoned railway, provides surprising finds. Connections between people and institutions are legion, bound by a bureaucracy we often take for granted. And all of this can be found in the map collections of the Municipal Archive—you just have to know where to look. Compass rose from a Damage Map belonging to the Board of Education, 1940. From the collection of the Board of Estimate and Apportionment, NYC Municipal Archives.